The Dynarex Antifungal Cream is an itch-relieving skin cream to help combat symptoms from athletes foot to vaginal yeast infections, and jock itch as well as mouth infections. These uncomfortable symptoms can cause an unpleasant day for you and to those around you if you are not able to satisfy your itch; you may be more prone to handle a minor situation and inconvenience more irrationally and poorly. Why carry on a burden you do not have to, the antifungal cream has a fast-acting formula. The cream helps stop these irritating itchy symptoms in these hard to reach areas while also helping treat the cause of the fungus. The Dynarex 1233 Itch Relieving Antifungal Cream is made with a strong 1 percent Clotrimazole USP is found in most any antifungal cream as its formula and benefits are in line with ridding of the fungal infection with the continued use of the cream. With the use of the cream, you will notice that your itch irritation will lessen as time passes, do not stop use when you do not feel the effects of the itch to do so as this is part of the process for the topical cream. Continue use as directed in the instructions to ultimately relieve yourself of these symptoms. 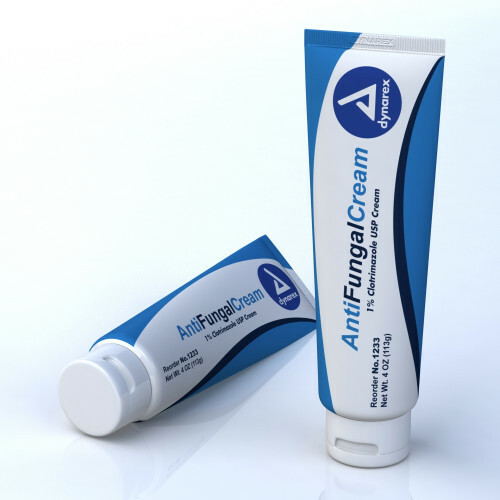 The Dynarex Antifungal 4 Oz Skin Cream is provided in a small-tube size, enough to carry convenience where ever you may be and yet small enough to be carried within the confines of your bag or purse. Ultimately, being able to enjoy sitting at your desk or being still without having the burning sensation to scratch your itch is far more pleasant than the actual relief you may get by scratching an itch you can get rid of. If you are interested in a powder form of antifungal medication, you may be interested in the Thera Antifungal Body Powder.